In the speech recorded in Acts 7, Stephen speaks of “the tabernacle of testimony in the wilderness” which God commanded Moses to make according to the pattern he had been given (7:44; cf. Exodus 25:9; Hebrews 8:5). 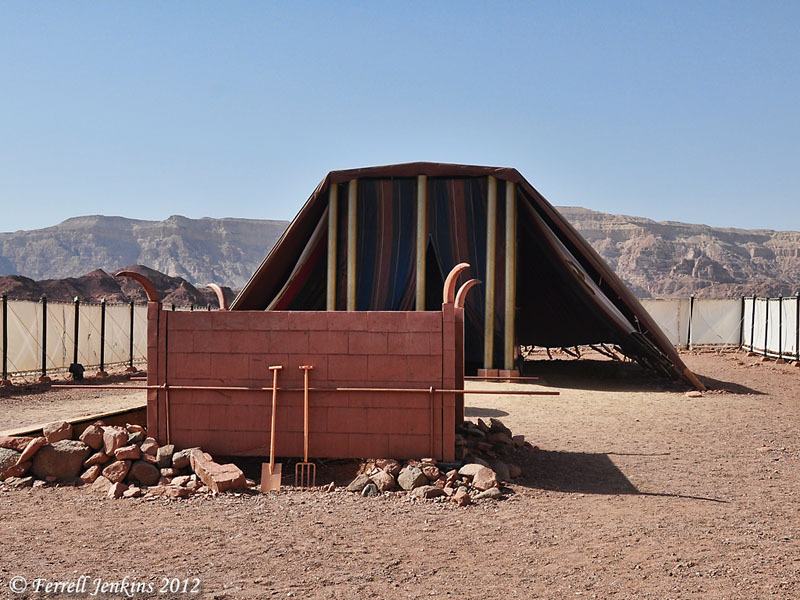 A full size model of the Israelite tabernacle has been constructed in Timna Park, 17 miles north of Eilat. The original tabernacle was built while the Israelites were at Mount Sinai (Exodus 25-40). The tabernacle was a movable tent of worship which was taken each place Israel wandered during the forty years in the wilderness. The photo below shows the front of the Tabernacle with the altar of burnt offering in front of it. Tabernacle in the Wilderness at Timna. Photo by Ferrell Jenkins. When some men from the Synagogue of the Freedmen argued with Stephen, “they were unable to cope with the wisdom and the Spirit with which he was speaking” (Acts 6:10). They secured false witnesses to say that Stephen has spoken “blasphemous words against Moses and against God” (6:11). They also charged that he constantly speaks against “the holy place and the Law” (6:13-14). The following brief summary by the late Princeton scholar, Charles R. Erdman, explains Stephen’s argument in a nutshell. Stephen had been accused of blasphemy for declaring that God could be worshiped without the Temple and its rites; but, in referring to sacred history, he reminded his hearers in his first sentence that “the God of glory appeared unto … Abraham, when he was in Mesopotamia”—surely this was outside the Holy Land and the Temple. So he had revealed himself to Joseph in Egypt, and to Moses in the wilderness. Even when the Temple was finally built, Solomon, in his prayer of dedication, had reminded the people that the Most High could not be confined to the precincts of any building [1 Kings 8:27]. Step by step, the revelation of God had become more perfect, and it had reached its culmination in Christ, so Stephen seems to argue: first God revealed himself through a man, and then a family, and then a nation, and then a ceremonial, and finally in his Son. Toward the appearance of the Messiah all Jewish history had moved as to its goal; and now, through Christ, believers can worship God not only in the sacred mountain and the Temple, but wherever they turn to him “in spirit and truth.” God has a message for each of us even when surrounded by pagans and unbelievers, as Abraham in Mesopotamia; or when imprisoned and alone, as was Joseph in Egypt; or when driven into some wilderness by presumption and anger, as was Moses; or when worshiping by some ritual, as in the tabernacle; or when bowing beneath the beauties of some superb tabernacle, as did Solomon. However, all our experiences should be interpreted as designed to point us to Christ, and to lead us to find fellowship with God in him. Gan Hashlosha National Park is one of the most beautiful places in Israel. It is located in the eastern end of the beautiful and green Jezreel Valley. (At this point it might be referred to as the Harrod Valley.) Gan Hashlosha means the garden or park of the three. The name commemorates three early Jewish settlers who were killed by a land mine while looking for a place to establish a kibbutz sometime between 1936 and 1939. The Arabic name for the site is Sakhne, which means “hot springs.” I recommend a stop here on your next visit to Israel. It is a pleasant place where many tourists enjoy dipping their feet in the warm waters. Gan Hashalosha National Park in Israel. Photo by Ferrell Jenkins. The water in Nahal Amal is saline and not fit for drinking. 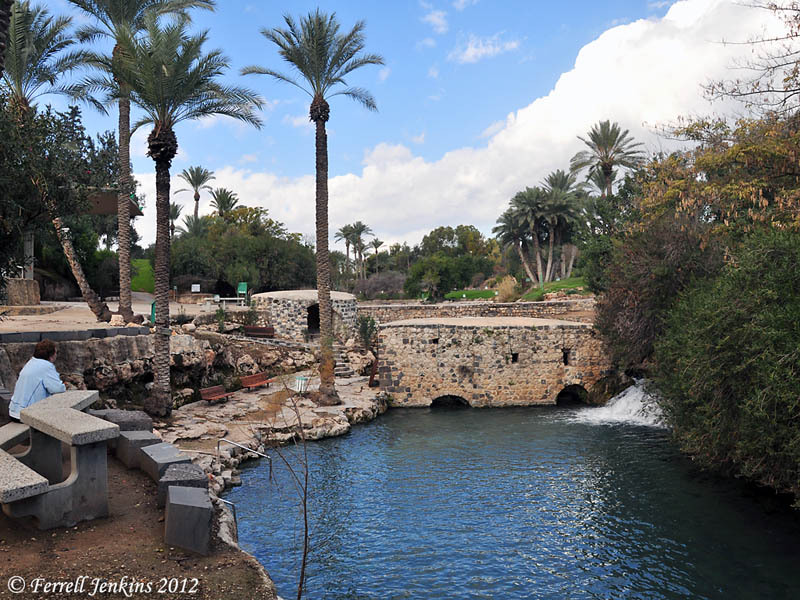 The place, only a few miles from the Jordan Valley, provides a fitting illustration for a text about the place where John the Baptist was baptizing after he moved from Bethany Beyond the Jordan. Do not misunderstand. Once while visiting here I told my group that this was a place not far from Aenon near Salim and provided a good illustration. A little later I overheard one of the ladies telling another who had missed my explanation, “This is where John baptized.” In fact, they both missed the explanation. Perhaps we will discuss Aenon near Salim in another post. Could there be an “Internet Use Disorder”? A leader from each of the giants in this field is quoted. Facebook, Twitter, Zynga (FarmVille), Google (YouTube). This is a worthwhile article which you may read in full here. A few weeks back, Dr. Rod Decker commented on an article by Kevin Bauder. If this subject intrigues you, you might enjoy reading what they have said. Click here for Decker, and here for Bauder. Self-control is a fruit of the Spirit (Galatians 5:23). Note Peter’s admonition in his reminder epistle to Christians. Acts 6 records the selection of seven devout men to tend a need that has arisen among the new disciples of Christ. The function of these men seems similar to that of those later referred to as deacons (Philippians 1:1; 1 Timothy 3:8ff.). One of these men, Stephen, had a leading role in the spread of the word and the resultant obedience to the faith by many. Even priests were becoming obedient to the faith. But there was opposition which eventually led to the stoning of Stephen. These Freedmen were liberated slaves (“Former Slaves” in the CEB). The term Libertines used in the KJV and the ASV probably leaves the wrong impression to a modern reader. An inscription was discovered by French Archaeologist Raymond Weill in 1914 (some say 1913) in the area of the hill of Ophel or the City of David, south of the Temple Mount in Jerusalem. The inscription is known as the Theodotus Inscription. Theodotus was the name of the priest and synagogue ruler whose name is the first word of the inscription. It is 25″ wide and 17″ high. This synagogue was for the use of Jews of the Diaspora when they visited Jerusalem. Saul of Tarus in Cilicia was probably comfortable among those who assembled there. Theodotos Inscription from Synagogue of Freedmen. Photo by Ferrell Jenkins. This inscription was formerly displayed in the Rockefeller Museum, but is now exhibited in the Israel Museum. Click on the image for a larger one. The phrase “synagogue leader” which is used three times in the inscription is the Greek term archisunagogos. Luke uses the same term three times in his history of the early church (Acts 13:15; 18:8; 18:17). In each case he is writing about a synagogue leader of the Diaspora Jews. While doing some searching for information I came across an interesting account on Twitter. Kinneret Bot is a computer that tweets “the water level of Lake Kinneret/the Sea of Galilee, Israel.” You can get to KB here. Thursday the water level was 211.67m below sea level. For most Americans that is 694.46 feet below sea level. We reported the level of the lake November, 2010, at 701.71 ft. below sea level. This shows considerable improvement, but it is nearly three months before much rain can be expected. I enjoy visiting the pier at Tiberias on the Sea of Galilee. The gauge that measures the level of the Sea is a nice attraction. The view that we captured in this photos shows the southeastern shore of the Sea. 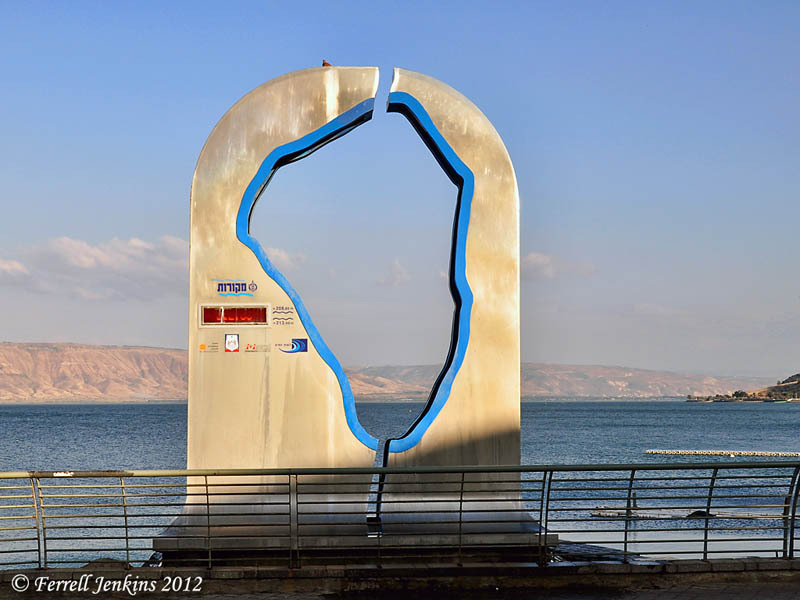 Gauge on the pier at Tiberias showing level of Sea of Galilee. Photo by Ferrell Jenkins. The Sea of Galilee is also called the Sea of Tiberias by the Gospel of John. Update: Sorry that the link to Kinneret Bot was incorrect. Refresh your browser and check again. Thanks JG. Todd Bolen, over at the Bible Places Blog, is giving away another five volumes of the Pictorial Library of the Bible Lands. Any five you choose. The entry period ends Friday. Check details here. The Israel Antiquities Authority announced the results of archaeological excavations carried out at the Mediterranean city of Akko (Acco in some English versions). 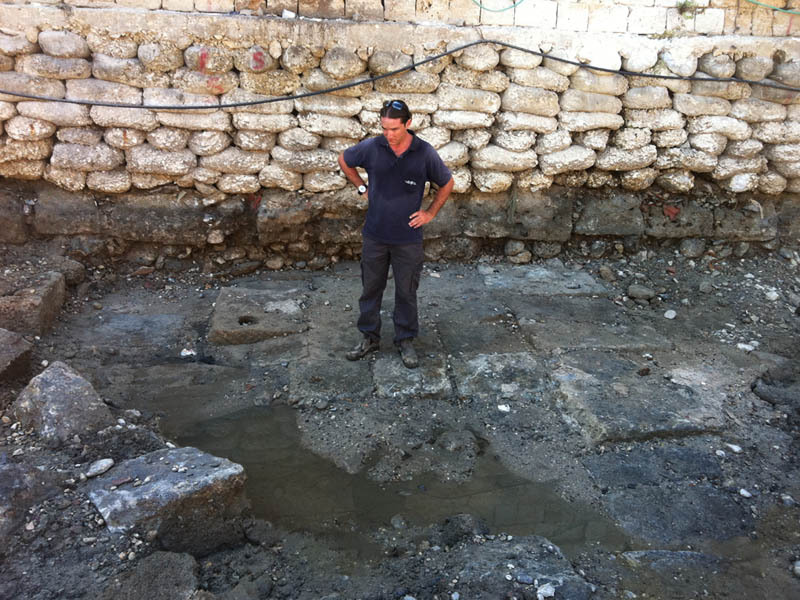 A member of the Marine Archaeology Unit of the Israel Antiquities Authority standing on the ancient quay that was exposed in Akko. In the middle of the picture one can see the floor of the quay, built of large dressed stones. In some of the stones there is a hole for inserting a wooden pole – probably for mooring and/or dragging the boat. Photo: Kobi Sharvit, courtesy IAA. Evidence of a harbor operating during the Hellenistic period (3rd-2nd century B.C.). This harbor was said to be the most important harbor in Israel at the time. A mooring stone that was incorporated in the quay. There was a hole in the stone in which the mooring/anchoring rope was inserted. Photo: Kobi Sharvit, courtesy IAA. Acco is mentioned only once in the Bible. The city is within the territory originally allotted to the tribe of Asher, but the tribe was unable to conquer it. After about 100 B.C. the coastal city was known as Ptolemais (Acts 21:7). Paul spent one day with the brethren here on the return from his third journey. An imported bowl characteristic of the Hellenistic period. 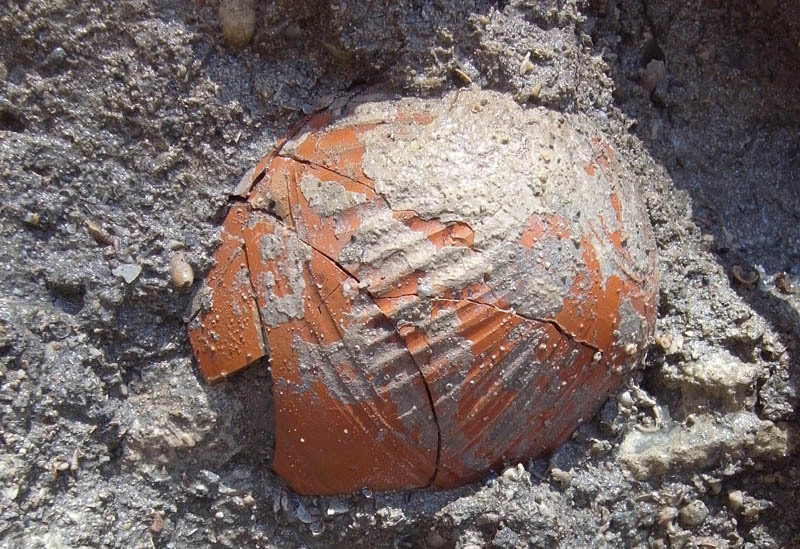 The bowl was found in a layer of harbor sludge. This layer contained thousands of intact pottery vessels, potsherds, etc. Photo: Kobi Sharvit, courtesy IAA. The full IAA report with links to the photos is temporarily available here.